← Trump empowers America battling Democrats and Republicans alike! Have you ever heard of the “alt-right” before now? That’s because the “alt-right” is the creation of leftists who, in their bigoted minds, want to make Republicans the racists by forging their own reality. They do this so they can justify waging war on Republicans. The Left is at war with itself and the Right is caught in the middle as the scapegoat of their twisted ideology. These are the fascists, the racists, and the Christian haters of the Left. None of these groups are rightwing. They are all leftists. They are all the same people who have been part of the Democrat Party in America. They all hate America, Christianity, capitalism, and liberty. They all embrace their own bigotry, violence, and totalitarian socialist dictatorships. The alt-right is a fiction of liberalism just as the so-called alt-left. In liberal’s dysfunctional world the alt-right are the racists and the alt-left are the righteous defenders of the oppressed. It is their fantasy world they want to bring to life. They want to create a reality in which they are ones fighting the racists rather than being the ones who are the racists. It is the delusion they create in their own minds so they can justify their fascist, racist, anti-American, anti-white violence. In their version of reality they are the righteous fighting the wicked and the KKK, white supremacists, and neo-Nazis represent the evil that they project as being all Republicans, all the TEA Party, all conservatives, and all Christians. The people who say ‘do not judge all Moslems based on Islamic terrorists,’ those who obey the Koran’s most fundamental teachings, condemn all members of the Right based on the hatred of their own orphaned leftists. The KKK was not created by Republicans, but by Democrats. Now that Democrats have embraced blacks, whom they have lured into their party as welfare voter slaves, they have no use for their old militant arm of anti-black racists. Instead they now embrace anti-white racists and declare that they are innocent of racism because they were victims of it. The simple truth is that the KKK and BLM are both racist hate groups and both need to be destroyed! BLM is the leftist anti-white black supremacists fighting the KKK anti-black white supremacists. This is a war between Democrats, and it is only the Democrat media propagandists telling the lies trying to pin half of their own factions on Republicans. This is just like World War II in which the totalitarian regimes of capitalist hating Nazis and Communists thought they could ally to destroy the free nations of the world, but ended up at each other’s throats. In that war, Democrats believed that “the enemy of my enemy is my friend,” but the Communists were just another enemy with whom they allied to defeat another. It was Democrats under FDR who caused that war with their policies of sucking up all the wealth and making the world destitute throughout the 1930s. They made Republicans their scapegoat just as the Nazis did with the Jews that resulted in the Holocaust, and the Soviets did with the Cossacks of Ukraine that brought about their Great Purge. America said that could never happen here, but we are seeing the maturation of that movement today. America was just another faction of imperialism fighting other imperialists, which is why the world sees America as only the most powerful of the evil nations in the world. Republicans, conservatives, and Christians must be very careful NOT to ally with any of these factions, or even allow them to stand beside good people as a matter of convenience to fight the Left. The enemies of our enemy are not our friends, but another enemy, and allying with them will only lead to more evil as it did with America and Russia. America only made that alliance because both Germany and Russia were more powerful than the free nations of the West even with America’s help. Without Russia, America’s death toll and war effort would have been strained to the breaking point. FDR allying with Stalin was a necessary evil to defeat Nazi Germany, but Churchill saw the truth and warned him against making Russia too strong. Good people often have great difficulty in recognizing evil and understanding how to combat it. The Left always tries to hang their evils around the necks of the righteous. Witness how Democrats are trying to lay off their orphaned KKK on Republicans. 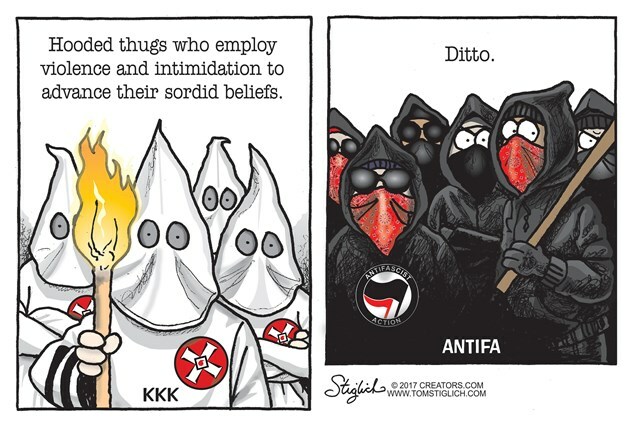 Recognizing Antifa for what it is, not anti-fascists, but their own brand of fascists is the first step in taking them down. Make no mistake, however. When one leftist group is exposed and crushed, they just change the name and create another. This is an eternal war between good and evil, and evil will forever use subterfuge and deception to corrupt the good. Life is a choice between doing what is right and what is easy. It is easy to fall for the lies of the Left and go down their road of good intentions alongside them. President Trump is doing well in his fight against Democrats and their RINO allies, but the people must be trepidatious of his seeming lack of comprehension of the evil the world faces in a resurgent Islam. His ban notwithstanding, with Gorka removed from the administration, but Gen. McMasters subsisting, it appears that Trump has yet to understand that Islam is not a religion. Terrorists are not aberrations of Islam, or murderous atheists, but are obeying the fundamental teachings of Muhammad’s death cult. The key to winning any war is to know your enemy, and McMasters is a holdover from the Obama regime in which Islam is excused for its Jihad and the world is endangered all the more. If America does not recognize the evil it fights, then it will fail. This entry was posted in Politics and tagged Antifa, BLM, Christianity, Communism, Democrats vs. Republicans, Donald Trump, Islam, KKK, Leftist ideology, Liberal Fascism, Media propaganda, Nazism, Racism. Bookmark the permalink. Keep up the good fight Dusty!